​We are excited to share with you all the details about our upcoming destination wedding in Puerto Vallarta! ​We hope you can join us May 4th to 11th, 2019 to celebrate wit1h us at the beautiful Hard Rock Hotel in Puerto Vallarta, Mexico! ​Please read below to learn about the resort and see rates to join us during our wedding week in paradise! Deposit required by July 13, 2018. Remaining balance due by January 29, 2019. Explore the lifestyle of a rock n' roll star, with all the very best at your fingertips. Escape to the legendary beaches and azure waters of Bahia de Banderas in the heart of Riviera Nayarit, Mexico. Hard Rock Hotel Vallarta is a luxury, all-inclusive resort 20 minutes from the excitement of Puerto Vallarta that indulges your senses. With a gorgeous beachfront setting, the Hard Rock Hotel Vallarta is the essence of all-inclusive coastal luxury and tranquility. Whatever your pleasure, enjoy unlimited food and beverage, nightly entertainment, 24-hour room service, a liquor dispenser and mini bar in your guest room and an abundance of other services and amenities. It's all covered even taxes and gratuities, at our all-inclusive luxury resort in Nuevo Vallarta..
Get a taste of the rock star lifestyle, or at least eat like one. Put your senses center stage when exploring world cuisines made with fresh, exotic ingredients, bold flavors and artful presentations. Hard Rock Hotel Vallarta offers six distinctive restaurants with international cuisines, including Italian, Asian, Mexican and Brazilian. Enjoy sky-lite indoor dining and delicious Brazilian cuisine at Ipanema. Dine at Frida for contemporary Mexican fare with a playful twist. Chow down on mouthwatering Italian cuisine at Ciao and enjoy Asian gastronomy and sublime sushi at Zen. Stop by The Market for our bountiful international buffet and Pizzeto for brick-oven style pizza. Our festive bars and lounges offer creative light fare snacks, and appetizers. Savor exquisite Italian cuisine in the warm, romantic ambiance of Ciao. Indulge in the vivacious foods of Italy and the Mediterranean with subtle textures and bold flavors that infuse passion and zest into your dining experience. Discover the fiery flavors, spices and passions of Mexico at Frida, serving Mexican cuisine in a festive atmosphere. The a la carte menu offers regional specialties, paired with tasty margaritas and tequilas. Enjoy mouthwatering Asian cuisine, including Izakaya, teppanyaki and sushi from the extensive a la carte menu. With its modern Japanese decor and peaceful vibe, Zen dishes up fresh, creative eats off the vibrant lobby. ​Feel the chill vibes and dine in the privacy of your room or suite with our 24-hour room service menu. Whether you're craving breakfast, a romantic dinner or a late night bite, room service offers an extensive menu of gastronomic goodies and beverages whenever you want them. Nuevo Vallarta offers endless activities and outdoor adventures - from golf to sightseeing tours to bike riding treks. Carved out of the magnificent Nuevo Vallarta landscape, nestled between the ocean and the mountains, the Hard Rock Hotel is the place to play, explore and enjoy all the fun activities that make Vallarta an outdoor lover's paradise. Our Vacation Planner Desk is ready to get you on your legendary journey - from city tours to zip-line canopy adventures. 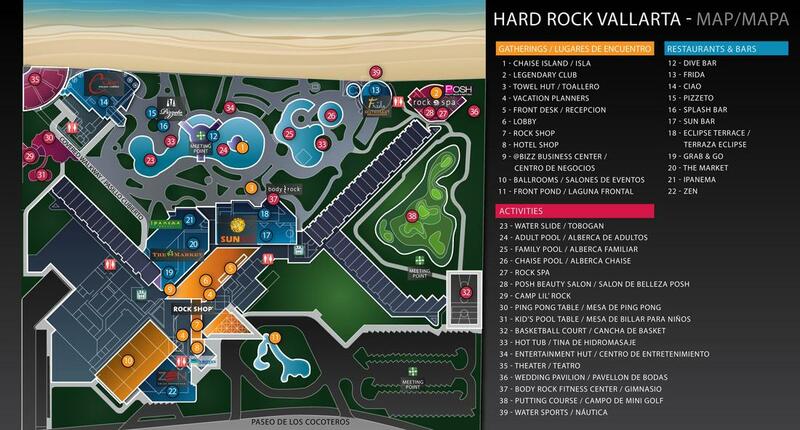 Hard Rock Hotel Vallarta offers smash – hit recreational activities every day, including beach volleyball and soccer, bike tours, morning walks, stretching clases, dance instruction, Spanish lessons and live music throughout the resort. Shoot a few hoops on the basketball court, enjoy a bicycle at the resort and explore the beauty of the landscape and the charming fishing village that surrounds us. Visit our outdoor amphitheater for evening shows and theme parties with refreshments served Monday through Saturdays from 9pm to 11pm. Hard Rock Hotel Vallarta is the perfect place for limitless aquatic adventures - from scuba diving to swimming with dolphins. Situated on the jaw-dropping sand beach and blue waters of Banderas Bay, our resort is a haven for water sports, like scuba diving, snorkeling, waterskiing, parasailing, sailing, kayaking, whale watching, deep-sea fishing and swimming with dolphins. Walk to the marina and beach for fun kayaking and boogie boarding in the emerald waters of the bay. Take scuba diving lessons in our dive tank and discover the excitement of scuba diving in Puerto Vallarta. Explore Puerto Vallarta's natural attractions, including Los Arcos National Park, or enjoy a cruise on the bay with intoxicating sunsets. Get an all access pass to electrifying scuba diving and snorkeling in Puerto Vallarta. The resort features a scuba diving demonstrations so you can learn the art of scuba diving. Grab some snorkeling gear from the Water Sport Hut and stroll down to the gorgeous beach to dive into the warm waters of Banderas Bay. Our Activities Desk can arrange scuba diving trips to amazing places like Los Arcos. No choice should be made between rest and relaxation or rock 'n' roll. This means that now all Rock Spa® treatments and packages are included without limit in your stay. While you enjoy this unlimited spa promotion, you can also use your Limitless Resort Credit to add more activities to your stay! City Tour — Journey through the best local attraction of Vallarta. Sunset Cruises — Relax with a tranquil voyage through Banderas Bay. Channel Tours — Cruise through mangroves and exotic tropical wildlife. Dolphin Resort Credit / Dolphin Resort Credit Gold — Play and swim with Bottlenose Dolphins. Canopy — Rocket through 10 zip line trails, all with a view. Snorkel Rock Experience — Explore the site of Los Arcos National Park. Rock n River Expedition — Limitless adventure. Thought up to $1,800 Limitless Resort Credit or Double Resort Credit was an epic part of your stay? Well it’s time to think even bigger, because your favorite piece of paradise is getting a serious upgrade. Welcome to the brand new Limitless All-Inclusive*, whether it’s playing a round of golf at the world’s only Hard Rock golf courses, finding zen at the spa with a Rhythm & Motion treatment, fine dining or an action-packed adventure at the region’s most breathtaking cenotes, you can squeeze as many of these as you want into your stay, they’re included. This is the future in all-inclusive luxury and the vacation experience - we've nixed the cap on resort credit dollars for you to sit back, relax and fully indulge in paradise and luxury. Wedding Group Rates- ARE NOW EXPIRED. Please contact Ryan for new prices. ​The resort is fully all inclusive; all meals, drinks, activities and entertainment is included in your price; plus airfare from select cities and an airport transfer in Puerto Vallarta! ​Scroll down to read the Frequently Asked Questions and submit your information to book! A $250 CAD per person deposit is required by July 13, 2018. ​The balance is due by January 29, 2019. Experience the unparalleled energy of Vallarta. Plug in to your vacation lifestyle in one of our 348 iconic guestrooms and ocean-view suites, designed with the Mexican vibe in mind, including custom-designed furniture, and breathtaking views of Banderas Bay. Our provocative accommodations feature signature vacation amenities, including HDTVs, WiFi, marble baths with a separate shower and hydro spa tub, cozy bathrobes, turndown service and 24-hour room service. Mix up a drink from the wine and liquor dispenser and stocked mini-bar. Lounge on your balcony and savor unparalleled views of the resort landscape and sunsets over the blue waters of Banderas Bay. You’re a Rock Star now. Soak it in and enjoy top-shelf luxury and everything you need for an unforgettable all-inclusive performance with one king bed or two double beds. This room type does not include any type of ocean view. / Max occupancy 4 guests, including children ages 4-17. A maximum of 1 infant (ages 0-3) will be allowed to stay in the same room with 4 guests. ​Connector cost from Kamloops, Kelowna or Victoria to Vancouver round trip is $60 +$15 tax = $75 per person additional. Connector cost from Winnipeg or Regina to Vancouver round trip is $95 + $15 tax = $110 per person additional. ​A non refundable $250 CAD per person deposit is required to book your package. Airfare from selected cities is included in your package. ​The flight schedule has not yet been released by the airline; the airline releases the flight schedule approximately 330 days in advance and times are subject to change. If an overnight is needed on-route it is an additional cost to the passenger and "not" included in the above rates. A non refundable deposit of $250 CAD per person is required to book your package. ​The deposit is required by July 13th, 2018. The balance is to be paid in full by January 29, 2019. ​Please contact Ryan through the contact form below, to apply a payment towards your reservation. Cancellation charges will apply to guests that can no longer travel. ​Guests can cancel up to final payment. Loss of deposit, $250 per passenger. ​Between 60 days and 31 days prior to departure, 50% of the total price per passenger non refundable. ​Between 30 days and less prior to departure, 100% fully on refundable. ​If the cancellation affects and/or changes the room occupancy, rates will apply based on the new occupancy. Airfare from selected cities is included in the package. ​The flight schedule has not yet been released by the airline; the airline releases the flight schedule approximately 330 days in advance. If an overnight is needed on-route it is an additional cost to the passenger and "not" included in the above rates. Please fill out the form at the bottom of this page to submit your details to book your package. Once submitted, your credit card will be processed for the deposit within two days. Once the reservation is confirmed you will receive an email from Wedding Butlers including your reservation details and invoice. Name changes from 22 days prior to final payment is $100 CAD per name change. Name changes from 7-21 days prior to departure will be charged $250 CAD per name change. No name changes 0-7 days prior to departure. ​Please ensure that all passenger information is exactly as it appears on each passenger's passport.